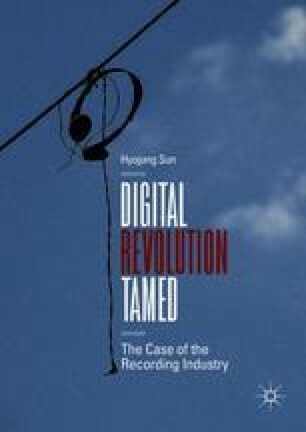 Following on the previous discussion, this chapter provides an in-depth empirical investigation on INgrooves and addresses the reintermediation process that took place on the digital music distribution networks. It details INgrooves’ innovation process that parallels the process; digital music distribution networks have become reintermediated. Tracing the history from the beginning of the business sparked by iTunes to the partnership with Universal Music Group, this chapter illustrates the process of emergence of new intermediaries and the resurgence of the market control. The detailed process involved in reintermediating distribution infrastructure will reveal the missing link between the prediction and what has happened in the digital music distribution networks. Bates, S. 2010. Beatles for Sale: EMI Puts Abbey Road Studios on the Market [online]. The Guardian. Available from http://www.theguardian.com/business/2010/feb/16/abbey-road-studios-sale-emi. Accessed 16 Nov 2013. Christman, E. 2013. Fourth Quarter Market Share Report: Indies & Market Share [online]. Billboard. Available from http://www.billboard.com/biz/articles/news/5763065/fourth-quarter-market-share-report-indies-market-share. Accessed 28 Nov 2013. Christman, E. 2017. Sony Merges RED Into The Orchard: What the Music Giant’s Latest Consolidation Means for Indie Labels [online]. Billboard. Available from https://www.billboard.com/articles/business/7817640/sony-music-orchard-red-indie-distributors-merged. Accessed 27 Feb 2018. Pham, A. 2013. Questions Answered: Robb McDaniels, Founder/CEO of INgrooves/Isolation Network [online]. Billboard. Available from http://www.billboard.com/biz/articles/news/1560617/questions-answered-robb-mcdaniels-founderceo-of-ingroovesisolation-network. Accessed 9 Oct 2014. Universal Music Group. 2008. Universal Music Group Distribution (UMGD) Expands Digital Services with INgrooves Strategic Alliance [online]. Available from http://www.universalmusic.com/corporate/detail/544. Accessed 8 Oct 2014.